The veteran alternative band put on an extremely fun performance during a special two-set show at Cleveland's Beachland Ballroom. It's amazing that after 33 years as a band, the members of They Might Be Giants still seem like they have a blast during one of their shows. Never mind that most groups don't even come close to reaching three decades, sticking with anything for that long takes commitment and a whole lot of love for what you do. Of course, They Might Be Giants isn't your typical band. 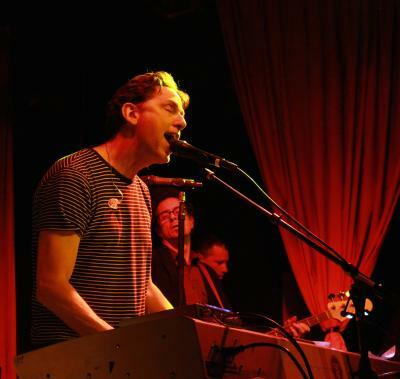 No, the veteran rock group started by John Flansburgh and John Linnell back in 1982 has managed to charm the pants of listeners for decades and hasn't begun to slow down as evidenced by the wonderfully fun performance the quintet put on at Cleveland's Beachland Ballroom Tuesday, April 21. The night was billed as "An Evening with They Might Be Giants," and the group made sure that the fervent crowd went away placated, playing two sets and a pair of encores. That's right, They Might Be Giants opened up for They Might Be Giants. Yes, that's as awesome as it sounds. The band kicked the evening off with "Can't Keep Johnny Down," an absolute blast of a song off of 2011's Join Us. That was just the beginning of a massive show, as Flansburgh, Linnell, and bandmates Marty Beller, Dan Miller, and Danny Weinkauf treated the sell-out audience to 33 songs, with engaging - and often hilarious - stage banter filling the musicless voids in between. Given the band's massive discography (which now includes the rather enjoyable Glean, an album released on the day of the show), there were always going to be songs that got cut from the setlist. Sure, there was no "Particle Man" or "Don't Lets Start," but it hardly mattered, as John, John, Dan, Danny, and Marty put on a magnificent show, one that ranks up there as one of the most fun concerts this reviewer has been to in recent memory.